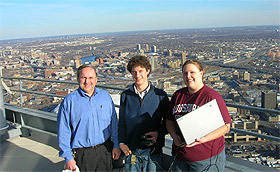 Earlier this month, two students in professor Gary Egbert’s general physics lab went to the top of one of the tallest buildings in downtown Minneapolis to conduct a laboratory experiment. Ashley Gruhlke and Michael Schmit measured the change in atmospheric pressure with altitude from the 15th to the 54th floor of the 225 South Sixth Building. The building’s engineer, Frido Verkman, accompanied them.